– goes back to 1933, its star began to shine in earnest over five years later. Hailed as the perfect weapon by Nazi propaganda, the Augsburg product was everything but, at least in its early days. The real breakthrough in the Bf 109 history came when an attempt was made to give that small, simple fighter one of the best powerplants of the time. The attempt, as history so clearly showed, was a complete success. The early models of Messerschmitt fighter design – designated B, C and D – were ill-equipped to meet the challenges of the war to come. They had poor armament, fragile design and seriously underpowered engines. Early reports from the fighter’s tests in Spain all mentioned poor performance of its Junkers powerplant. The armament fit, originally consisting of two MG 17 machine guns, was also criticized as inadequate. The first attempts to modernize the “109” included the introduction of a two-bladed, variable pitch metal VDM propeller in place of the wooden Schwartz unit on the B model aircraft. The C-1 and C-3 variants were also upgraded with the addition of wing-mounted armament. Junkers provided its new engine, Jumo 210 G, which featured a modern fuel injection system in place of a carburetor used in earlier models. Additional improvements including small adjustments to the airframe and manufacturing methods introduced in the Bf 109 D-1 model did little more than show that further development of the Jumo powered fighter was in fact a dead-end proposition. Work to develop a modern aircraft engine began at Daimler-Benz in the mid 1930’s. The designers focused their attention on creating a small, compact powerplant with high power output. The ultimate goal was to deliver a high capacity engine that would be compact enough to power small fighter aircraft. The 600 series engines eventually emerged as a twelve cylinder, in-line inverted V design. What made the new powerplants stand out was their high capacity, use of light alloys in the design and a high degree of automation. Additionally, the engines were designed to be easily mass-manufactured. 1936 saw the introduction of the DB 601 A powerplant. The engine was a state of the art design: it featured direct fuel injection, automatic boost air pressure control and could accommodate internal weapon between its cylinder blocks. DB 601 delivered 1,175 HP, almost 40 percent more than the Junkers unit used on the earlier Messerschmitt 109 models and it was only marginally bulkier than its predecessor. The Daimler installation was tested on the “109” in summer of 1937. Three Bf 109 B airframes were modified for that purpose. Aircraft designated V-14 and V-15 (the latter was flight tested in winter of 1937) were equipped with DB 600 and, later, DB 601 engines. In spite of the need to radically re-design engine cooling system on the test aircraft, the airframe modifications and subsequent tests progressed swiftly. At the same time another Bf 109 B airframe was modified and designated V-13. That machine was specifically designed to take on the prestigious world speed record for a conventional landing gear aircraft. To that end the fighter was equipped with a modified, high performance DB 601 engine, tuned up to deliver 1,600 HP instead of the standard 1,100 HP. All aircraft were demonstrated at a Zurich air meet in July 1937. After the return from Switzerland the V-13 prototype was fine-tuned and took off for a record-breaking flight on November 11, 1937 with Dr Hermann Wurster at the controls. To the delight of German designers, the V-13 bettered the American record by 45 km/h. The new record now stood at 610.95 km/h. The purpose of the whole affair was clearly a one-off demonstration of the aircraft performance (or the prowess of its designers) and a huge propaganda impact that it produced, all at a cost of subjecting the airframe to maximum loads and practically running the engine to destruction. The first ten Bf 109 E examples were ready in early 1938 as the so called “0” series. Among the characteristic features of Bf 109 E-0 aircraft were elongated booster air intakes inherited from the record-breaking V-13, covered MG 17 barrel troughs and fake markings based on the paint schemes used by training units. The aircraft were part of the deception scheme masquerading as Bf 109 D variants. 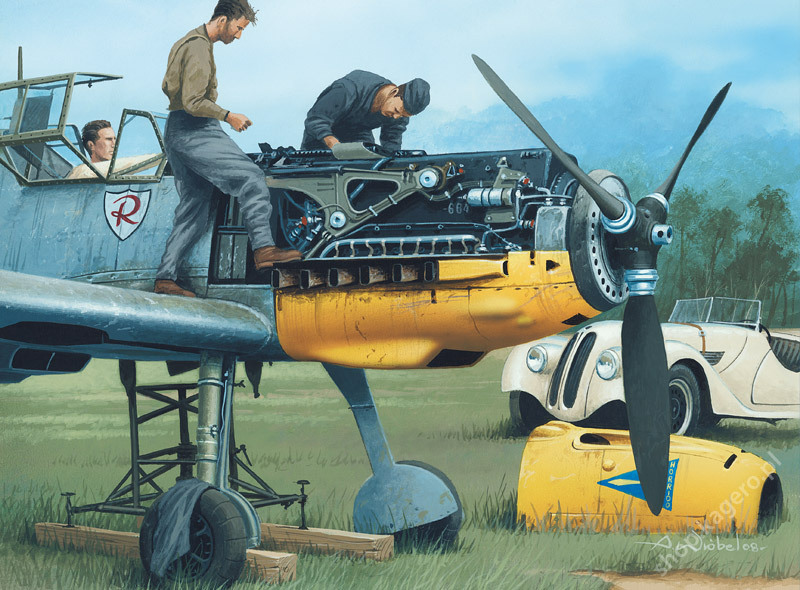 The new engine installation forced the Messerschmitt engineers to partly re-design the airframe. To minimize drag the cowl was very tightly wrapped around the new DB 601 powerplant. Booster air intake scoop was moved from above the engine cowl to its port side. The most prominent feature, however, was a completely re-designed engine cooling system. A scoop underneath the engine, much smaller than in the earlier Jumo models, now served as oil cooler air intake, while two engine coolant radiators were placed under the wings. The new wing could now accommodate both types of armament designed for light fighter aircraft – MG 17 machine guns and 20 mm MG-FF cannon. The engine drove a three-bladed, variable pitch VDM propeller. Internal fuel capacity also increased from 337 liters to 400 liters. 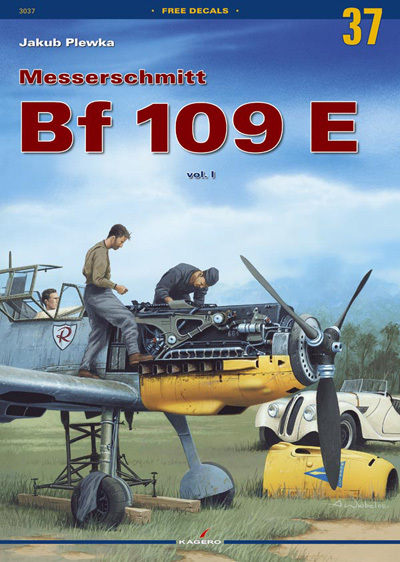 Bf 109 E went into production in the fall of 1938 in two armament variants – E-1 and E-3. The successful adaptation of DB 601 engine to the Bf 109 airframe eliminated two most notorious drawbacks of the early design. The new Messerschmitt was no longer unresponsive and featured improved medium and high altitude performance. More power also translated into heavier internal weapons load that now could be carried. The engine’s modern design provided automated flight operation, which meant the pilot was practically free from monitoring engine parameters in air combat. In simple terms, the engine automation adjusted boost air pressure depending on flight altitude, controlled ignition and fuel injection and governed prop pitch via an electrically powered mechanism. During normal flight automatic mode operation produced optimum operating parameters and fuel burn. In air combat the system allowed the pilot to concentrate on the fight and fire control. In such situations the engine was supposed to deliver maximum power on demand, regardless of flight conditions – and it did so, extremely well. When in danger, a Messerschmitt would just firewall the throttle and the engine immediately responded with increased fuel flow to the injectors, higher boost air pressure and required prop pitch. The Messerschmitt would then accelerate rapidly behind a visible, black trail of exhaust smoke. Apart from that “automatic support” the engine offered improved durability at extreme power settings, a feature that many rookie pilots really appreciated. Simple operation of the powerplant not only offered an option to disengage from the fight and return to base safely, but also prevented engine damage at prolonged emergency power settings. When looking at critical opinions of former Bf 109 E pilots it is hard not to notice a striking contrast between an excellent engine and simple, unsophisticated airframe. Messerschmitt 109 was a difficult mount for inexperienced pilots. The huge power surplus meant that during the take-off roll and immediately after rotation the pilot had to work real hard to counter very strong left yaw tendency. The Messerschmitt was tail heavy and during ground operations turns had to be accomplished using full rudder deflection and aggressive wheel braking. Landing with any degree of slip or skid would invariable result to landing gear damage. In three-point configuration forward visibility was appalling and on rollout very judicious use of brakes was required, or the aircraft would promptly flip on its back. In the air, at medium speeds, the aircraft was easy to control, but at speeds approaching maximum values the flight controls became increasingly stiff and required substantial physical strength to operate. At slow speeds, near the stall, the pilot had to use good judgment in adjusting power and be ever mindful of leading edge slats popping out unexpectedly. The German pilots biggest headache during the air battles over England and the Channel was the Messerschmitt’s inadequate fuel supply. On many occasions they could do little more than turn around and run for home when their fuel status approached the minimum. The fighter’s weapons fit was augmented by the addition of 20 mm cannons, although they had their weaknesses, too: modest ammunition supply, low muzzle velocity and rate of fire, to mention just a few. Early lessons learned in combat operations demonstrated that cockpit armor protection needed to be strengthened. The solution was the re-design of the windshield to include a thick, bullet-proof front panel and the addition of armor plating behind the pilot’s back. The re-designed windshield, stronger, heavier canopy framing and armor plating behind the pilot’s seat installed on Bf 109 E models further deteriorated visibility from the fighter’s cockpit. The cockpit itself was cramped and very uncomfortable. Former Messerschmitt pilots agree that any sortie longer than 45 minutes was extremely exhausting. During air combat thick canopy frames made maintaining situational awareness difficult. Many pilots complained about gun discharge gases and exhaust fumes entering the cockpit. The aircraft’s engine cooling system did not provide the option to cut off a damaged radiator and maintain coolant flow, so a hit in the cooling system resulted in immediate loss of coolant followed by engine overheating and seizure. A wreckage of a Bf 109 E was recovered in Russia in 1990. The aircraft was completely stripped down and rebuilt to a flying condition in England. It was then purchased by a well-known aircraft collector Ed Russel and shipped to the U.S. Today the white “14”, rebuilt to almost stock configuration, is the only airworthy example of the type. The aircraft has a very impressive combat record dating back to air battles over England. On several occasions (albeit in its original E-1 configuration) it was flown by none other than legendary Hans-Joachim Marseille. After overhaul and some upgrade work the fighter went on to serve in Russia, where it was eventually abandoned. After fifty years and a costly rebuild the aircraft is now one of the most unique examples of the Messerschmitt 109 living legend. The E model went into production in 1938. Compared to its predecessors the new aircraft featured significantly re-designed nose section caused mainly by the installation of a DB 601 powerplant. The engine cowling was fitted very tightly around the new engine to reduce drag to a minimum. Four small blisters on the lower part of the cowl covered the front part of cylinder heads and compressed air duct. On the upper part of the cowl, slightly more bulbous than on the earlier Jumo-powered aircraft, there are two prominent bulges, just aft of the nose machine gun troughs, which house gun synchronizers. The booster air intake scoop was moved from above the engine to a location on the cowl’s port side. The most prominent feature of the fighter’s new model was a completely re-designed engine cooling system. The chin scoop, much smaller than on the Jumo variants, was now an oil cooler air intake, while two engine coolant radiators were placed underneath the wings. E-1/E-3. E-1 and E-3 were the first variants of the Bf 109 E series. Those early production models featured DB 601 A power plants and were configured as fighter aircraft. Some of the airframes were later modified to carry external stores (E-1/B and E-3/B variants). Early production aircraft were also gradually retrofitted with more powerful DB 601 N and Aa engines. The only difference between those two variants was the type of wing-mounted weapons. The Bf 109 E wing was designed to accommodate both an MG-FF cannon and an MG 17 machine gun in two adjacent wing bays. Looking at the wing’s leading edge of a Bf 109 E-3 and later models featuring the wing mounted cannon, one can clearly see plugged machine gun ports right next to the cannon muzzle.